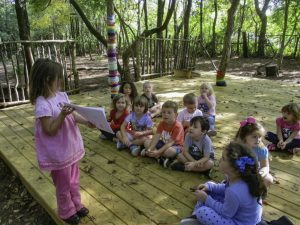 At Stonebrook Day School of Murfreesboro, preschoolers and nature education go hand-in-hand. Young children are endlessly curious, relatively unafraid and unbiased, and nature is something that preschoolers can experience directly. Their brains are wired to learn as they construct knowledge through sensory-motor and concrete experiences. They are built for it; they are closer to the ground than we are. Children spend substantial periods of time outside, and it is easy and safe for them to get there. Our forest is a classroom, literally! Scientific research in early childhood development is revealing the critical connection between time spent innate sand the outdoors and a child’s developing brain. Immersive time in nature fosters a child’s intellectual, emotional, psychological and physical growth. Daily play experiences in a natural area significantly increase balance and coordination among preschoolers. The level of vegetation in play areas makes a significant difference in the incidence of play, with more play occurring in high-vegetation spaces. 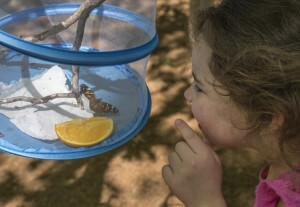 A child’s desire to connect with nature is strongly tied to the philosophy of Stonebrook Day School. When experiences with nature are embedded in the preschool curriculum and daily routine, children benefit physically, emotionally, and intellectually as they have new experiences, exercise their bodies, and enjoy the feeling of freedom that comes from being connected to the natural world. This also helps them to become good stewards of the earth’s resources!